Jan 31st 2014 @ IBC, Leavenworth, WA. no cover / all ages! 6:30-8:30pm at the Redmond Town Center, Redmond, WA. (click for directions). SHOWS CANCELLED:Two December performances @ Tandem Dinner and Wine, Bothell WA. 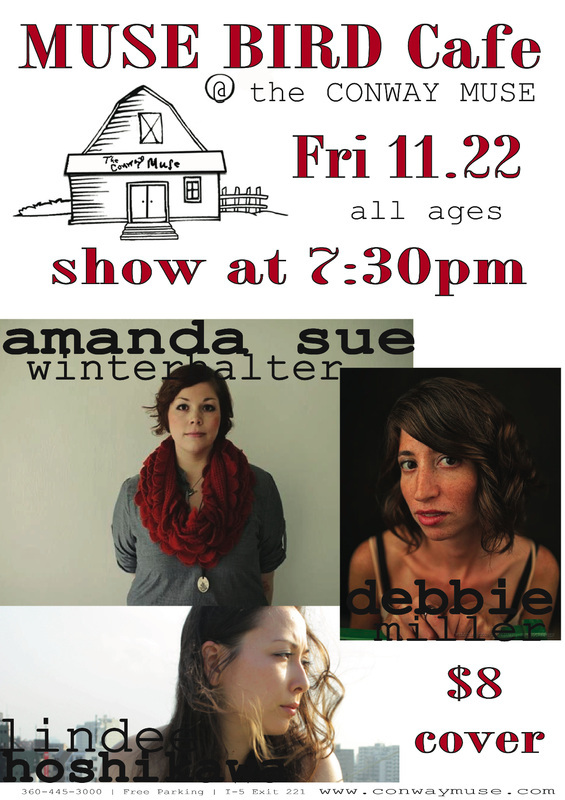 Nov 22nd @ The Conway Muse, Conway (Mount Vernon), WA. Directions to The Conway Muse here. Nov 27th @ The Upstairs, (Belltown) Seattle, WA. 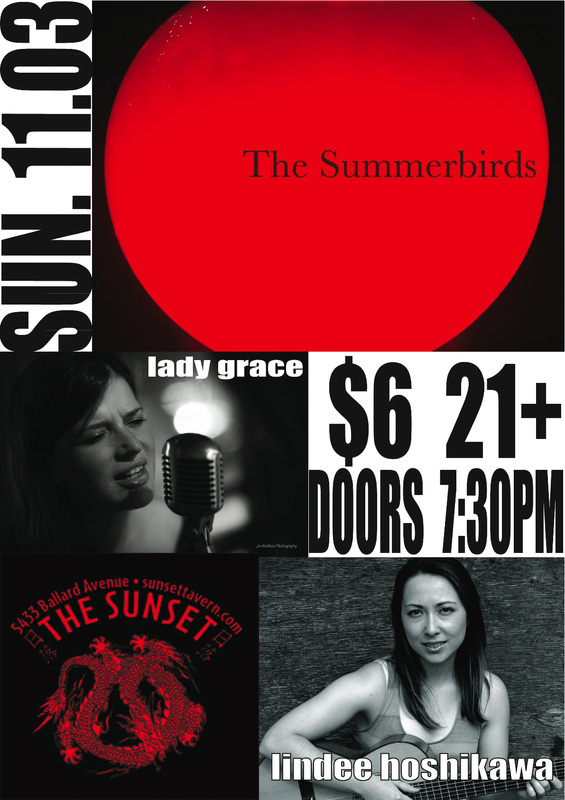 Nov 3rd @ The Sunset Tavern with Summerbirds and Lady Grace, Seattle, WA. 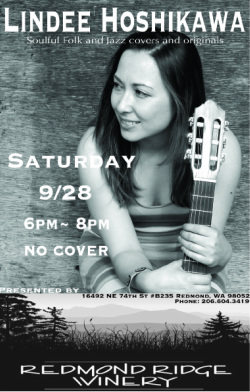 Oct 18th @ Redmond Ridge Winery Tasting Room, Redmond, WA. Sep 21st 2013 @ Tastebuds Wine Bar, Wenatchee, WA. Sep 20th @ Pybus Market, Wenatchee, Wa. 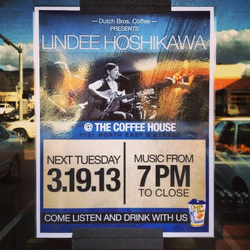 Music from 6-8pm. No Cover. Aug 24th 2013 @ MATCH wine and coffee, Duvall, WA. Join Tara Kearns and I for an evening at Match Wine and Coffee in Duvall! You'll be charmed by this little cozy bar in the heart of old town. Music from 7:30-10:00pm. No Cover. Aug 13th 2013 @ Musicquarium at The Triple Door, Seattle, WA. Aug 8th 2013 @ SIP Issaquah Highlands, WA. 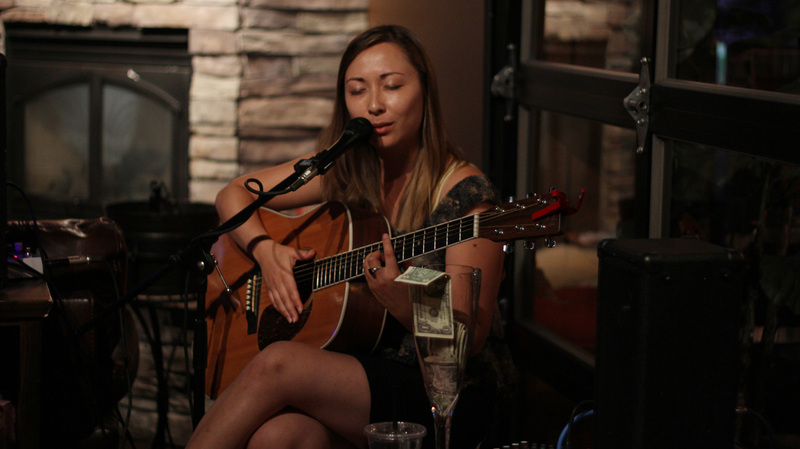 July 20th 2013 @ Tastebuds Wine Bar, Wenatchee, WA. June 20th 2013 @ University House, Wallingford, WA. June 16th 2013 @ Principia College Guest House, Elsah, IL. I'll be playing a rare afternoon show from 12:00pm to 2:00pm. Blackbird Bistro offers UMBRIA coffee and excellent homemade food and wholesome baked goods. Come join us! June 7th 2013 @ Icicle Brewery, Leavenworth, WA. Can't wait to be playing Leavenworth again! Music starts at 7pm. Come out and enjoy wonderful craft beer in this lovely Bavarian-themed village. 6301 24th Avenue NW, Seattle, WA. This is a sweet little venue! If you like intimate settings and excellent Swedish meatballs, then you're in for a real treat! Join me for a classy evening at Cypress Wine Bar in Bellevue. 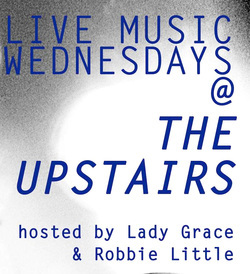 I'll be playing three sets of music from 8pm. No cover. Matt Wexler (http://bass.mattwex.com/) on bass. Tacket Brown (http://www.tacketmusic.com/About.html) on drums. With the fabulous Debbie Miller. This show is part of Art Up PhinneyWood Art Walk! It should be a fun evening full of things to see and do, so please join me! 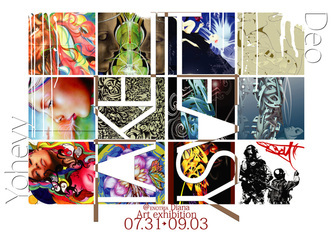 Come early and check out artwork by Devrim Ozkan (mono-printing meets oil painting meets mixed media meets love). and get some yummy coffee in your tummy! Sep. 7th and 29th @ Icicle Brewery, Leavenworth, WA. A quaint Bavarian-themed village. Hand-crafted beer. Cool peeps. My music. What more do you want!? Excited to be playing two nights in September! 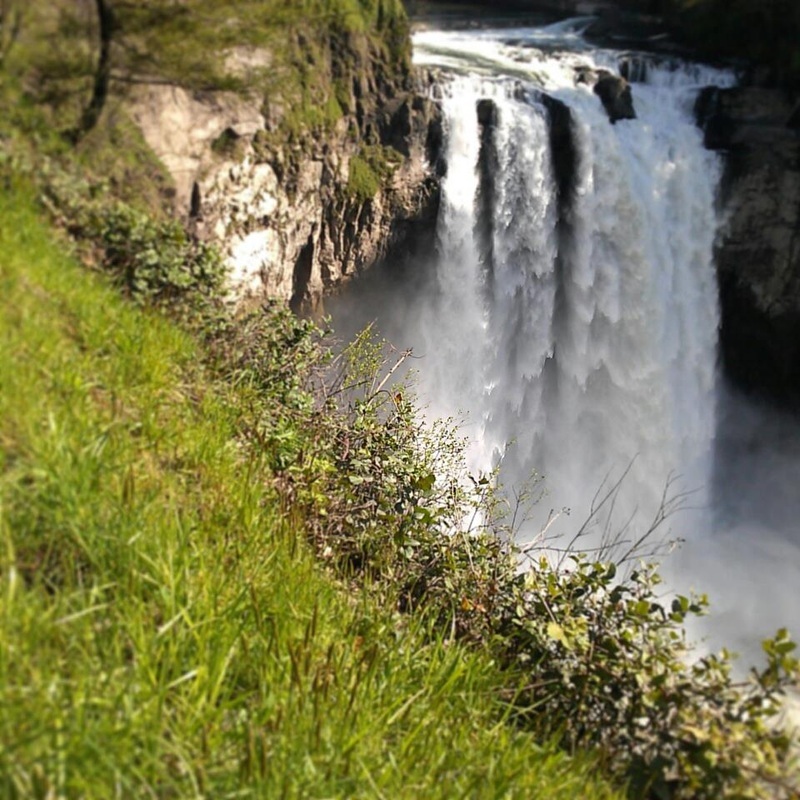 Come on over the mountains and join me! Free shows on the 7th (Fri) and 29th (Sat). July 15th @ Columbia City Theater! And I'll be sharing the stage with Justin Froese! and others TBD. Presented to you by THE WAREHOUSE. Show at 8:00 pm sharp. Only 25 seats per show, so make your reservations QUICK! Doors open 15min prior to showtime. Album cover art by Naomi Hanakata. Photo by Alan Williams. Feb 19th 2012 (SUN) GOGirls Tokyo @ Bar Gari Gari in Ikenoue. Hey Hey people, come out and enjoy your Sunday night with some sirens!!!! Go Girls Tokyo and Bar Gari Gari are proud to present the first Ladies Lounge of the year. 7.30: Cherrianne Brown - singer/songwriter from Decatur, Ga.
Jan 8th 2012 (SAT) First Sunday Back with MOSS @ Tokyo Lounge, Omotesando. Enjoy your first Sunday of 2012 listening to live performances while relaxing over a great spread of classic brunch fare - eggs, bacon, hash browns (all the classics) and reconnecting with friends & family! Doors open at 13:30 while live mellow acoustics (featuring Moss,Shamanz,and Lindee Hoshikawa) and live painting start at 14:00. At a very reasonable price of 3000yen per head, we invite you to join us to an afternoon of pure delight. OCT 23rd 2011 (SUN) @ The Conrad Hotel, Shiodome. Pink Angles of Life Charity LIVE! October is Breast Cancer Awareness month - we would like to do our bit in supporting those who need our help. Pay-as-you-go for your own expense directly at The 28 bar counter. Conrad has kindly introduced a special list of drinks at a special supported rate. Dress code: Think pink & be classy! one free drink w/flyer, so please ask me for one! NOV 23rd 2010 slum shock art show @ Flashers Gallery, Nakameguro. I'll be playing a short set during an art party next week. Come check out some Tokyo tattoo art while enjoying the chill sounds of goofy, DJ Martin, djamballa, HAMA, GCN-1, Jem(The Fuse) and of course, me! SEE MAP BELOW. OCT 31st 2010 Halloween SHOW! @ SECO Shibuya. Crazy impressive line up for this Halloween show! There will be: Bands, Live Paint, Dance and Visual performances. Tickets are 2500 yen with flyer (ask me for one!) or 3000 yen at the door. Door/Show starts at 6:00pm the show will end before last train. SEP 4th Jam House 2010 Final Party @ GirlsBar600, Shinjyuku. JULY 31st Yoheyy and Ayumi EXHIBITION Party! @ Camarada in Nakameguro. Yoheyy has invited me to once again play at an art opening, and I am so grateful for the constant opportunities! 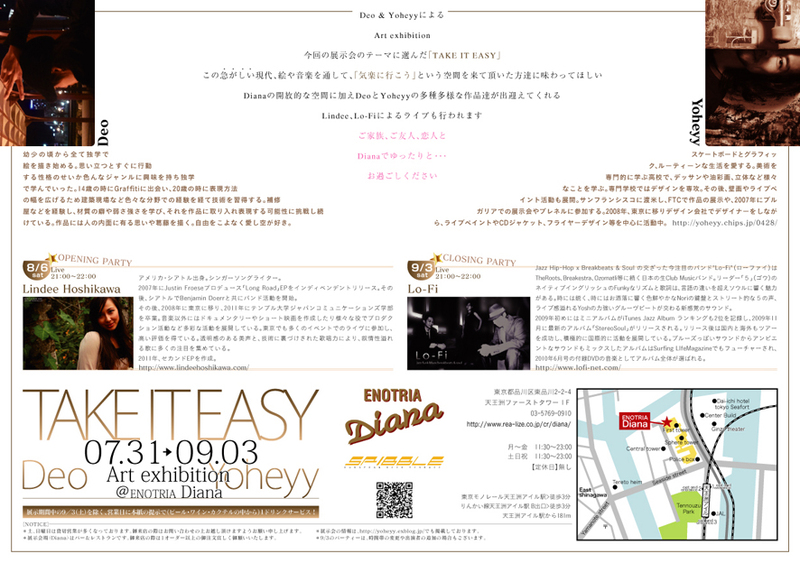 This time, its an all-you-can-eat-and-drink event (3000yen entrance) with art and music. There are some other performers as well, so it should be a flavor-full night! Again, I'll be accompanied by Jeremy Killgo on the homemade drums! yay! more info HERE. JUNE 19th and 20th 2010 "exhibition Family" at Yasashi Yokan Gallery in Meguro.